An American-born Parisian’s debut is a high intellectual entertainment about jigsaw-puzzles: a galloping satire that’s also a murder mystery to boot. The puzzle fad comes and goes. It was huge in the Depression (when the Society of Friends of the Puzzle was founded—later to become The Puzzology Society) and it has grown big again now, in the early 1990s, a fact looked upon with scorn by the likes of Upton Sutter, the smug and pretentious president of The Puzzology Society (with its tiny- remaining handful of members). The craze is seen very differently, though, by zillionaire Charles Wallerstein, who founds what’s called the JP Tour: a breakneck endeavor that pits one speed-puzzler against another, draws Super Bowl-size crowds, and makes buckets and buckets of money. 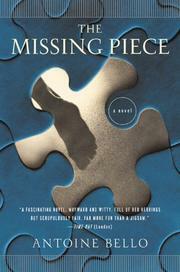 While the Puzzology Society discusses subjects like the relation between puzzles and mystery novels, the significance of “the missing piece” (“The final piece is, by definition, the one that precedes the missing piece”), and mounts “equilibrium” experiments (one worker forms bricks into a wall while another follows behind, taking them apart), Wallerstein and associates scout for talent the world over and make the JP Tour, year by year, ever the more successful and intense. So you can imagine the shock when, in 1995, no fewer than five people are murdered in that many months, all of them connected with the puzzling world, and all killed in the same way, though with puzzling variations. Whodunit? Bello tells his tale in 47 “pieces” (the 48th is missing) consisting of interviews, obituaries, news items, Puzzology Society minutes, scholarly works, extracts from board meetings, etc. It’s not always easy keeping straight who’s who—Bello often fleshes his characters meagerly—but nothing can compromise the brilliance of his satire here of sporting events, literary theorists, academia, Bill Gates–size fortunes, overspecialized athletes, and even anthropology. Though with some longueurs, Bello’s ride is generally swift, funny, and sharp—and, speaking of sharp, a “Solution” at end discloses method, motive, and murderer.